Willan. There are beautiful pictures, stories and recipes throughout the massive book, and while flipping through I decided on a simple goat cheese salad as the first recipe that I would try. The marinated goat cheese in the recipe needs two weeks to pull all the flavors together so it was time to get started on it. I swapped out oregano for the fresh thyme based on what was available in the garden. Use whatever flavors you enjoy most. Cut the goat cheese log into six even pieces. Pour a bit of olive oil on the bottom of a mason jar or whatever container you're using to store the cheese. 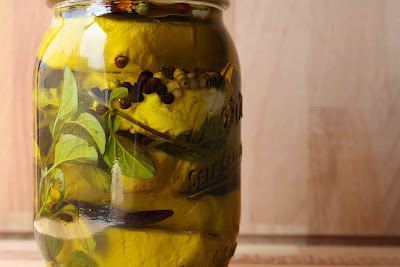 Place one piece of the goat cheese in the jar followed by a little bit of olive oil, some of the peppercorns, a bay leaf and a chile. Place one sprig of oregano along the side of the jar and continue layering the remaining ingredients, being sure to pour a little olive oil between each layer of cheese. Store in the refrigerator for two weeks before using. Enjoy! Wow, sounds like a project. Will you post the salad recipe after the marination stage is complete? sounds lovely. Wonder if the process will work with other soft cheeses? Hmmm, interesting :) Have you tried it yet? I am sure this will be so yummy!! Can't wait to see your post once you get to taste it after 2 weeks. Btw, lately we've been a little speedy/sloppy with pics for my posts (I've been taking alot of them when JiT is unavailable) and yours are just shaming me into a longer shoot for whatever I make next. Thanks for the inspiration! Hopie - I love goat cheese too! I bet Mint would be fabulous with this recipe. Let me know how it goes! Rachel - Absolutely! And I love these little projects. It's like practicing delayed gratification which lord knows I could use some practice at! Michele - I don't see why not. The recipe did say that if the cheese is left in the oil for more than four weeks it will start to break down - maybe that length changes depending on the cheese? ttfn - Not yet! I've just put it in the fridge and I'm going to do my darndest to wait the full two weeks. Cecil - you and me both! Rebecca - Thank you! I thought the photography would be the biggest challenge for me in this whole food blogging thing, but I'm having a ton of fun with it. All I can say is natural light, natural light, natural light. This looks delicous with lots of different uses! That looks like it's going to taste amazing! I've never seen anything like it. What a great blog you have! Just found it and so glad I did. Your recipes sound fantastic. I'll be back often to visit! Wonderful blog! You have a great eye for food styling and photography :) I'm a cheese addict and love the idea of "dressing it up" at home. Thanks for sharing.